RINGMAT PURE SIGNAL BLUE AND PREMIUM BLUE TONEARM CABLES use the same advanced Pure Signal cable technology found with all our interconnect cables. 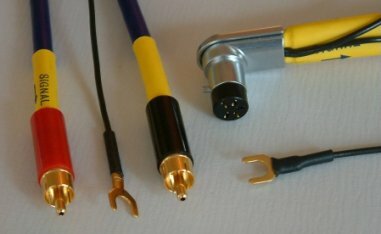 Separate cables are used for left and right channels with SME right angle DIN type connectors at source to connect at the base of those many tonearms that are suitable for this type of connection. At the other end of the tonearm cable there can either be our Ringmat RCA type phono plugs (RINGMAT PURE SIGNAL BLUE TONEARM CABLE) or WBT Nextgen RCA type phono plugs (RINGMAT PURE SIGNAL PREMIUM BLUE TONEARM CABLE) or BNC - see below. The standard length is 1.2m but other lengths are available to order. pace to lively music, but more importantly it allows every detail of a performance to be savoured, starting from the full atmosphere of the recording venue before a note is sounded, and thereafter keeping you on the edge of your seat in keen anticipation. The leading edge and decay of each note is completely natural. For more information about connectors available, click here to see the PLUGS & CONNECTORS section. 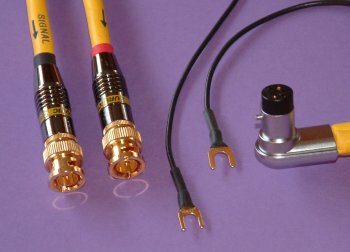 Ringmat Tonearm cables are now available with BNC connections. Excellent news for Linn/Naim users. We use the SME angled 5-PIN DIN plug to connect to the tonearm and Puresonic’s BNC connectors to connect to the Naim pre-amp. Information regarding the Puresonic 6055 BNC connectors, part of the Puresonic 24 KARAT GOLD Series, will be found here. As this sort of product is not one that is readily reviewed in magazines these days, the following mail from one of our customers, who encouraged us to make this product available, may be of interest to other Linn/Naim users. 'I installed the cable with no problems. The sound is so much better in every department that it is hard to know where to begin! Suffice to say that our enjoyment of music has been increased and by a good margin. 1. Stereo soundstage is enhanced, making the recording venue more obvious. 2. A layer of distortion is gone along with any trace of hardness or glare. 3. Presentation is faster with more detail. 4. Every nuance of the music is preserved. Of course, these improvements will be found with all our Tonearm Cables.